We recommend checking out our discussion threads on the HP Z27s 27" Widescreen LED Backlit IPS Monitor J3G07A8#ABA, which address similar problems with connecting and setting up Computer Monitors HP. The user manual for the HP Z27s 27" Widescreen LED Backlit IPS Monitor J3G07A8#ABA provides necessary instructions for the proper use of the product Computers & Solutions - Monitors & Displays - Computer Monitors. Immerse yourself in the Ultra High Definition experience with the Z27s 27" Widescreen LED Backlit IPS Monitor from HP. This UHD monitor features a 3840 x 2160 native resolution and support for up to 1.07 billion colors. The enhanced resolution helps to streamline your 4K workflow while the 178° horizontal and vertical viewing angles allow nearly everyone to see what is being displayed on the monitor. The Z27s can be connected to a variety of computer configurations as it comes equipped with HDMI 1.4, DisplayPort 1.2, and Mini-DisplayPort connectors complete with MHL support to stream content from your mobile device. You can also connect your USB peripherals directly to any of the four USB 3.0 ports located on the side of the monitor. A variety of viewing modes including picture-in-picture and picture-by-picture make comparing documents, photos, and other items simple. You can even divide the screen into four Full HD quadrants each with its own video source. Once configured, the display can be manipulated by swiveling, tilting, and pivoting the monitor into play for improved viewing comfort. Box Dimensions (LxWxH) 28.0 x 19.0 x 12.0"
The user manual for the HP Z27s 27" Widescreen LED Backlit IPS Monitor J3G07A8#ABA can be downloaded in .pdf format if it did not come with your new computer monitors, although the seller is required to supply one. It is also quite common that customers throw out the user manual with the box, or put the CD away somewhere and then can’t find it. That’s why we and other HP users keep a unique electronic library for HP computer monitorss, where you can use our link to download the user manual for the HP Z27s 27" Widescreen LED Backlit IPS Monitor J3G07A8#ABA. 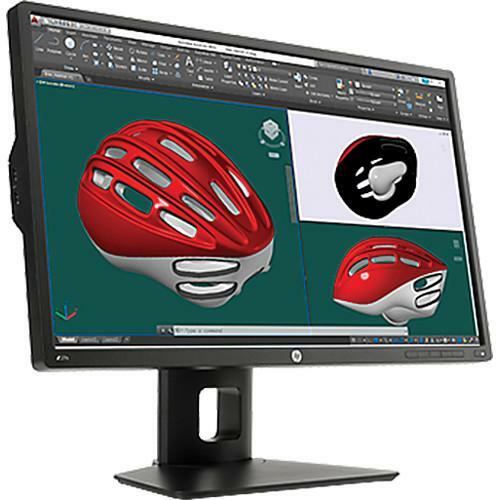 The user manual lists all of the functions of the HP Z27s 27" Widescreen LED Backlit IPS Monitor J3G07A8#ABA, all the basic and advanced features and tells you how to use the computer monitors. The manual also provides troubleshooting for common problems. Even greater detail is provided by the service manual, which is not typically shipped with the product, but which can often be downloaded from HP service. If you want to help expand our database, you can upload a link to this website to download a user manual or service manual, ideally in .pdf format. These pages are created by you – users of the HP Z27s 27" Widescreen LED Backlit IPS Monitor J3G07A8#ABA. User manuals are also available on the HP website under Computers & Solutions - Monitors & Displays - Computer Monitors.